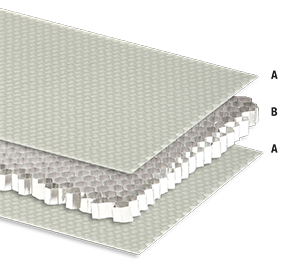 ALUSTEP ® 300 LIGHT is a lightweight composite panel with an aluminum honeycomb core faced with fibreglass impregnated with 290 gram epoxy resin. This panel offers unique characteristics as it combines lightweight with superior mechanical properties. This is the lightest panel of Alustep series. LIABILITY DISCLAIMER: The above data are to the best of our knowledge correct and are intended to give information about our products and their potential applications. No warranty is given or implied in respect of certain properties of the products or their suitability for a particular application. We reserve the right for technical changes without further notice. We guarantee impeccable product quality under our terms of sale.